Heavy card stock 3d vivid scenery. Includes three large scenes that can be mixed and matched along with two corner scenes. Assembly of scenes can vary as desired. When completely assembled it is 112" long x 14" high. Includes hydraulic dam, factory, town scene and mountain. 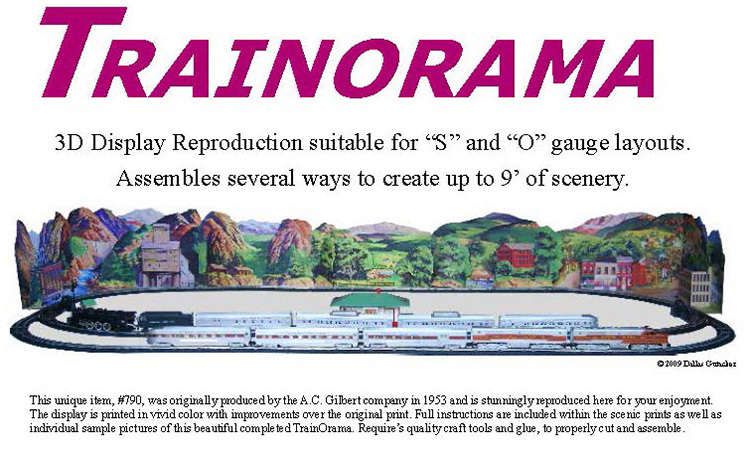 Suitable for use by "S" and "O" gauge operators. There are additional smaller backdrops available, these smaller backdrops are printed on paper that measures 2' x 4'. The actual height of the image varies depending on the image subject matter, clear skies will be the color of the plain paper on the upper sections.